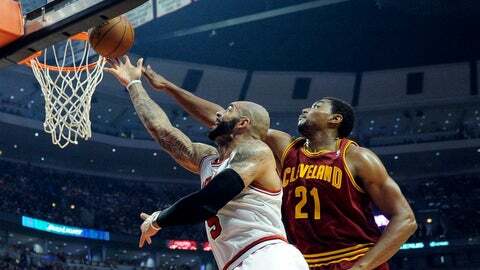 CLEVELAND (AP) — The Chicago Bulls are without starters Carlos Boozer and Kirk Hinrich against the Cavaliers. Boozer will miss his third game of the season Wednesday night with a strained left calf, while Hinrich is out with an injured right hamstring. Both were hurt in Monday’s win over the Los Angeles Lakers. Hinrich did not travel with the team to Cleveland, and is likely to sit out several games. Coach Tom Thibodeau expects Boozer to be back in a few days. Taj Gibson will start for Boozer and D.J. Augustin will take Hinrich’s place as Chicago faces former teammate Luol Deng, who was traded to the Cavs earlier this month. The Bulls signed guard Mike James to a 10-day contact. James was waived by the Bulls on Dec. 16.